Raman spectra recorded on the HOPG surface near a polystyrene bead (dotted line) and recorded through the polystyrene bead (continuous line). The focusing distance is the same in both measurements. (A) Video image of polystyrene beads (465nm diameter) deposited on an HOPG surface. 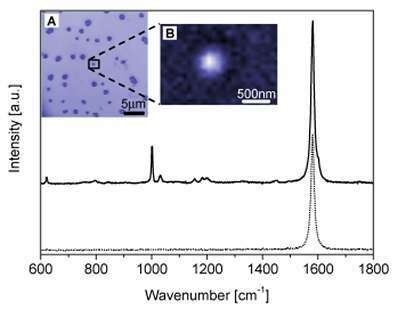 (B) Raman image obtained by integrating the G line (at about 1600cm-1)of HOPG in a region of 2 x 2.5 µm² around a polystyrene bead.